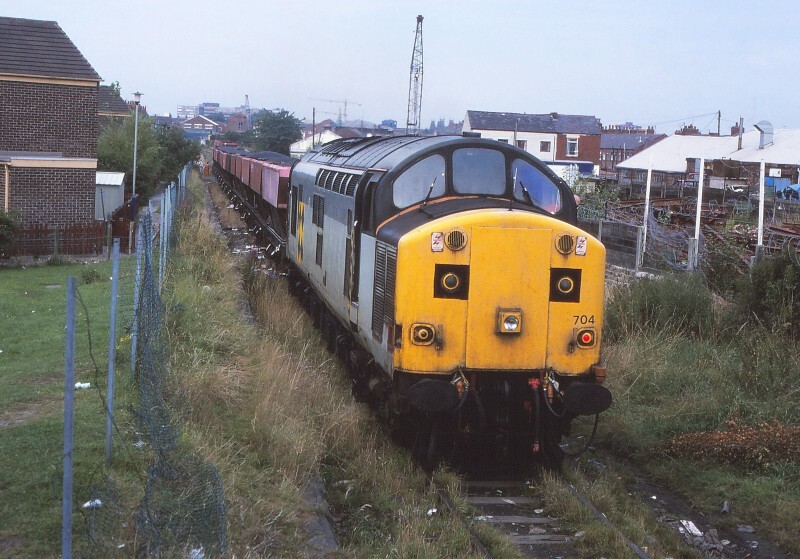 Martyn Hilbert's Railway Photography - Preston & District - Class 37, 37704 at Deepdale. Class 37, 37704 at Deepdale. 37704 stands on the former Longridge Branch, East of Skeffington Road level crossing on the 27th August 1993. This literally was the end of the line, the track in the foreground was the extremity of the former Preston to Longridge line retained as a shunt neck for coal trains coming to and from the coal depot beyond Deepdale Mill Street. The train was about to reverse the loaded HEA hoppers back through Deepdale Junction, taking the original 1840 route into the yard.